Our April 12th Reading Clubs are the day after tomorrow, and we still have a few spots remaining. If you can join us this Saturday for some Amazing Animals and Interesting Environments, visit our website TODAY and sign up! You can keep checking our website for openings today and tomorrow morning. If you're signed up but can't join us, please click here to cancel before 3pm on Friday so that someone else may take your place. 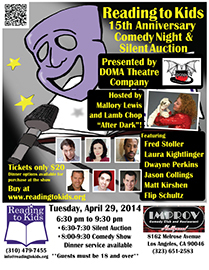 CELEBRATE OUR 15TH ANNIVERSARY WITH LAMB CHOP AT OUR COMEDY NIGHT & SILENT AUCTION! Did you know that this May Reading to Kids turns 15?! Way back in 1999 we started with 20 children and eight volunteers, and now we average 876 children and 367 volunteers every month! This Saturday we expect to give away our 125,000th book to a child! If you have ever volunteered with us, or are a supporter of children's literacy, please help us celebrate our quinceañera on Tuesday, April 29th at our 15th Anniversary Celebration, Comedy Night & Silent Auction at the Hollywood Improv! Joining Lamb Chop will be a handful of sidesplitting comedians hand-picked by the world famous Hollywood Improv. We don't yet know who our comedians will be, but the Improv guarantees they will be hilarious! You won't want to miss out on this event and opportunity to celebrate 15 years of Reading to Kids with returning volunteers you may not have seen in years! On Facebook we have a Reading to Kids Comedy Night and Silent Auction event, and it would really help if you replied to it that you are going. When you reply to our Facebook event, please also use the "Invite" button in the upper right to share the event and help us publicize this fun celebration of our 15th anniversary. If you can't join us for Comedy Night, please still share the above event with your Facebook friends and encourage them to go and tell you all about it. Every ticket you help us sell furthers our cause! Please also click the image below for a flyer in .PDF format, and forward it to anyone you know who may be interested in going to our Comedy Night. Please also print out the above flyer and post it wherever many people are likely to see it, perhaps with a note that you are going and inviting others to join you. Our Comedy Night makes a great night out with friends and co-workers! Become a Reading to Kids hero and help us gather the most interesting and exciting items ever for our Silent Auction! We've posted just the first 10 Silent Auction items so far with more to come, and we are looking for more unique, inventive items! Please see the Want to help? area of our 15th Anniversary Celebration, Comedy Night & Silent Auction webpage for links to a donation letter, donation form, and tips on how to best approach a business or person to donate to our Silent Auction. We thank you in advance! In the past we have had gift certificates, products, services, and tickets to fun events. If you work at or have a connection with a restaurant, retail store, or for a company with products or services to offer, please help us by asking for a donation to our Silent Auction. Whether or not you can volunteer to read this Saturday, please join your fellow volunteers and supporters at El Cholo Mexican restaurant this Saturday, April 12th to celebrate our quinceañera! Reading to Kids will be there around 12pm after the reading clubs, but the flyer can be used at any time this Saturday! Thanks, and we hope to see you on Saturday and/or at Comedy Night! - Celebrate our 15th Anniversary with Lamb Chop at Comedy Night! - Come to El Cholo this Saturday and They'll Donate 20%!